Pick a Resolution/Set of Resolutions – Identify resolutions related to your niche that’ll help others improve their own lives. They may be things you’ve tried yourself, you’re committing to now or you plan on trying later. If you have experiences with whatever resolutions you share, it can be really valuable to share your own challenges and/or triumphs. If you have a few ideas, you can turn them each into their own article. Write a Title and Introduction – Write a title and introduction that describes the area of life that requires the resolution you’ve chosen. The introduction should make it clear exactly why your article is important. That may include drawing from personal experiences. Describe the Resolution – Next, explain your resolution idea and why it works. This section can be somewhat brief because the execution of the resolution is explained in the next step. 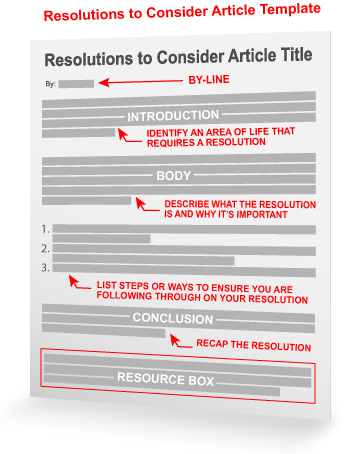 Make a List – List steps or ways to ensure your readers can follow through on the resolution. Lifestyle resolutions are easy to come up with, but they’re even easier to give up on if we don’t set ground rules or have ways to check up on ourselves. It may be a list of goals or steps in a process. Just make it clear exactly what needs to be done. Recap the Resolution – Recap your resolution idea and, once again, explain why it’ll help. Give the reader a feeling of security that they’ll be able to follow through with your suggestions. Remember that these types of articles have seasonal significance. There will be more interest in them during the beginning of each new year. That doesn’t mean they completely lose their value during the rest of the year. Leave out dates and other time-sensitive info and the articles will stay evergreen. Use this template today to write your next set of high-quality, original articles for more traffic back to your website or blog. Also, leave a comment to share your own resolutions or template ideas. Totally Brilliant and Conveniently Timely for 2011 – Great Idea! I love that idea. In fact i’m working hard right now to become a better writer. Looking for a start to an article to write today to get energized from the Christmas sluggishness. Never was into the Resolution thing but this seems right and so easy! Thanks Christopher! When I opened the email, my first thought was “oh please, not another “resolutions” article! I’m glad I visited, though, because I’ve actually learned a few new things and already have some ideas rolling around in my head. I have never been on to make New Years Resolutions, however I bet many would be highly searched for in the search engines. Great Tips. @dramafarmer, I got some great tips too. Just received an email regarding this. Great suggestion of this template. Will definitely use it in future. The introduction should even go beyond describing why the article is important. It should highlight the issue/problem/pain spot/challenge/struggle and what kind of mistakes people make when they encounter this. I’ve yet to write an article for EzineArtiles, but here’s what I do for my monthly e-news: I highlight the issue/etc & the why and then give a brief overview. The e-news then links to an article on my website with the solution – often with lists. Thank you so much Christopher….Its a really great tip for topics to write about…..My New year resolution is to improve upon my writing skills and work more harder to unfold the masterpiece within me which God has created inside…..
You have always given good information. I have changed computers several times and my subscription to your email got lost (over the years!). I am glad I found you again! I’ve yet to write an article for Ezine, but here’s what I do for my monthly e-news: I highlight the issue/etc & the why and then give a brief overview which then links to an article on my website with the solution – often with lists. Great idea about resolutions. Most people make new year resolutions but need the extra push to carry them out. Articles on resolutions would appeal to them. Thanks. Thanks, read your post, wrote an article and am awaiting approval. Great Idea. Yeah, its good idea. I think i will use it. with things that I want to improve in 2011. In the middle night I woke up and repeated in my mind all the written points. Today in the morning, when I opened the computer I found, as the first thing, your article with exact the same points suggestions. What this means? With the difference that in my list I put a supplementary point connected to general renovation of my home. And coincidences like this one, happened in the past too. I have also to add that I learned a lot from your style to write about a subjet. This is a great resolution that no-one should ignore. An excellent article with good ideas and template. Now there is no excuse of saying I don’t have anything to write about. Good piece on resolutions… Which gave me ideas for more articles, and a desire or wish that I personally could actually keep a resolution going for 3 months… yet alone a year! This is, indeed, a PRICELESS article! Merci beaucoup!!!!!!! Indeed, what a perfect topic for a Resolution article in the “Anger Management Category” – cannot wait to read it, because it sounds as if you have some first hand experience on this subject. People could really learn quite a bit from your insight. Excellent timing for this – I love the idea of using a template for writing my article . I’ll try it the first chance I get. Thanks for the heads up in the e-mail you sent. Great tips for the resolutions. Even can be applied towards article structure and will help me improve my article writing skills. Amazing..Very Good Idea.Thank U very much. It is good way for show press release. How does one put their picture (like several on your site) next to their comments? Great concise and easy to follow template. It is easy to get sidetracked when writing and this keeps the focus where it needs to be. Having this template is a valuable tool. Helps keep me on track to writing an article that leads the reader from one idea to another in a smooth and flowing fashion. Thank You. I’m resolute to becoming a expert writer and 1 to 3 articles a day. Thanks for you sharing, good info for a newbie here like me, but I’m still waiting for my articles to be approve, hope it will be so soon. I am pleased that EzineArticles is dedicated to helping authors. I have enjoyed writing, but am using a lot of time that I believe will be saved using the templates. Thanks. I rarely use templates but this one looks like one I will try. Thanks for continuing to bring us practical info and tips.